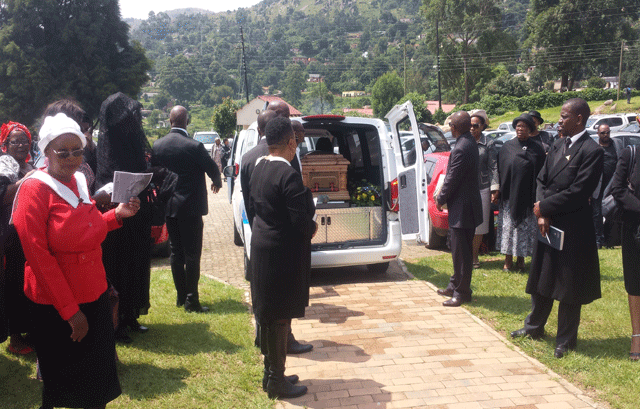 The late former Eswatini Bank (formerly Swazi Bank) Managing Director Sam Kuhlase’s children said losing their father in the manner it happened opened a wound that will never heal. They said their father did not deserve to die in such a brutal manner and those that did this should be brought to book. During the funeral of Kuhlase on Saturday at Mbangweni near Nhla-ngano, two of his children were overcome by emotions as they related to throngs of mourners the pain of losing their father who they were looking up to as the most valuable God- given gift they would treasure for the rest of their lives. The children said such senseless killing of their father has left them feeling that the country was a lawless state and to have it (country) win back its confidence from the nation and the world in general, the justice system has to do something. In attendance was High Court Judge Titus Mlangeni, a close family friend who used to attend any gathering organised by the Kuhlases, the last held on November 10, 2018. This was a thanksgiving ceremony organised by the deceased’s children in his honour. During that family gathering, Justice Mlangeni was one of the speakers. Kuhlase died last week Saturday after battling with injuries sustained when unknown rogues attacked him on January 16 at his residence, Esi-phumelele, which is a fast growing suburb near the notorious and crime infested Mathendele Township in Nhlangano. He was hacked all over the body and later dumped in a forest, only to be found unconscious after a long search. It is still unclear what the motive behind such senseless attack was. Kuhlase eventually passed away after over two weeks in hospital. Fikile Kuhlase, the first born, told mourners how sad they were as children to lose their father in such a cruel manner. She said she was completely gutted and devastated to lose such a great man who was her source of inspiration. Her speech pierced through the hearts of many when she related her father’s last words, reiterating how tough it would be to cope without him.